One of the first things people have been complaining to us about is the search box that appears by default next to the start menu on Windows 10. You’ll be pleased to know that there is a quick and easy way to hide the search box. 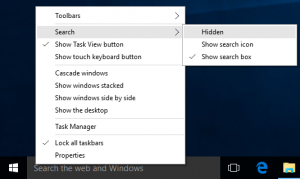 Simply right click anywhere along the bar, and then choose Search –> Hidden from the menu that appears. This hides the search box completely. If you haven’t yet upgraded to Windows 10, we suggest it is worth doing, especially for computers with Windows 8. If you would like Linden Design to take care of the upgrade for you, then please Contact Us today.